Tap the New Project (+) button, and then tap Trailer. Scroll through the styles, and tap the Play button to preview the trailer style. Under the preview, you see the length of the trailer and the number of cast members, if there’s more than one. When you’ve selected one, tap Create Trailer. The Outline and Storyboard screen opens. Tap in the Outline at the bottom half of the screen and type in the information, such as Movie Name, Studio Name, Director, and so on. There’s a pop-up menu for the Studio Logo Style. Here you insert media that will be assembled into your trailer. Tap the placeholder in the storyboard. Buttons for media choices appear at the top of the screen. Based on the description in the placeholder, tap the media type at the top of the screen. For example, if the placeholder reads “4.3s Wide,” you want to tap the Videos button at the top of the screen and select a video that’s 4.3 seconds long with a wide-angle point of view. Or tap the Camera button and record 4.3 seconds of wide-angle video. Tap the media you want to use. It’s inserted and the next placeholder is at the ready for media to be inserted. Repeat Steps 7 and 8 until all the placeholders are filled. 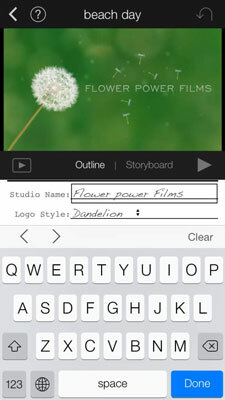 Tap any text fields on the storyboard. Tap Clear (just above the keyboard), and then type something applicable to your movie trailer. Repeat Step 10 until you reach the end of the storyboard. Tap the Play button on the right to preview your trailer in the editing screen or tap the Full Screen Play button (it looks like a playback arrow in a square) to play the entire trailer on your iPhone’s screen. Tap the screen to see the playback controls, and tap Done to return to the project. Tap the back buttons in the upper-left corner to return to the Projects chooser.